Heart muscle sheets cultured from muscle tissue taken from a patient's thigh were used to repair the patient's heart. 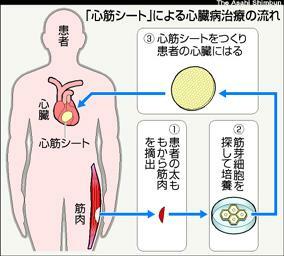 This is believed to be the first instance in which a patient waiting for a transplant was treated using something grown from their own cells, according to medical researchers at Osaka University Hospital. The procedure was performed on a 56-year-old male suffering from dilated cardiomyopathy, a condition in which a weakened and enlarged heart becomes unable to pump blood efficiently. To perform the procedure, the researchers first took about 10 grams of muscle from one of the patient’s thighs. Myoblast cells (a type of muscle stem cell) were then extracted from the muscle tissue, placed in a culture solution and grown into 50-micron-thick sheets measuring about 5 centimeters (2 inches) in diameter. Several layers of myoblast sheets were then applied to the surface of the impaired heart, where they helped strengthen the muscle and restore cardiac function. I'm sure we can offer free access to the heartbeasts and liverbeasts and so forth. For a while your colonists will have to come up to the Hospital to get treatment with the ramrobot symbiots, but eventually we can build culture tanks in Gamma and Delta and Eta." Via 'Heart muscle sheets' grown from thigh muscle.